Poison Point Contact with the Pok�mon may poison the foe. Enemy Pokemon have a 30% chance of becoming Poisoned every time they touch this Pokemon. Hustle* "Boosts the Attack stat, but lowers accuracy. ""This Pokemon's base Attack is increased by 50%, but its physical moves have 80% of their usual accuracy." any direction. Even the slightest sound does not escape this POK�MON�s notice. 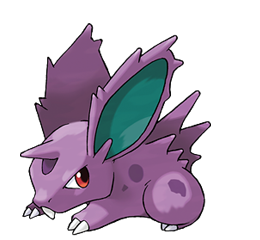 Emerald The male NIDORAN has developed muscles that freely move its ears in any direction. Even the slightest sound does not escape this POK�MON�s notice. Leaf Green It stiffens its ears to sense danger. The larger its horns, the more powerful its secreted venom. Diamond/Pearl It scans its surroundings by raising its ears out of the grass. Its toxic horn is for protection. Platinum It scans its surroundings by raising its ears out of the grass. Its toxic horn is for protection. Heart Gold It is small, but its horn is filled with poison. It charges then stabs with the horn to inject poison. Soul Silver It raises its big ears to check its surroundings. It will strike first if it senses any danger. Black It scans its surroundings by raising its ears out of the grass. Its toxic horn is for protection. White It scans its surroundings by raising its ears out of the grass. Its toxic horn is for protection.